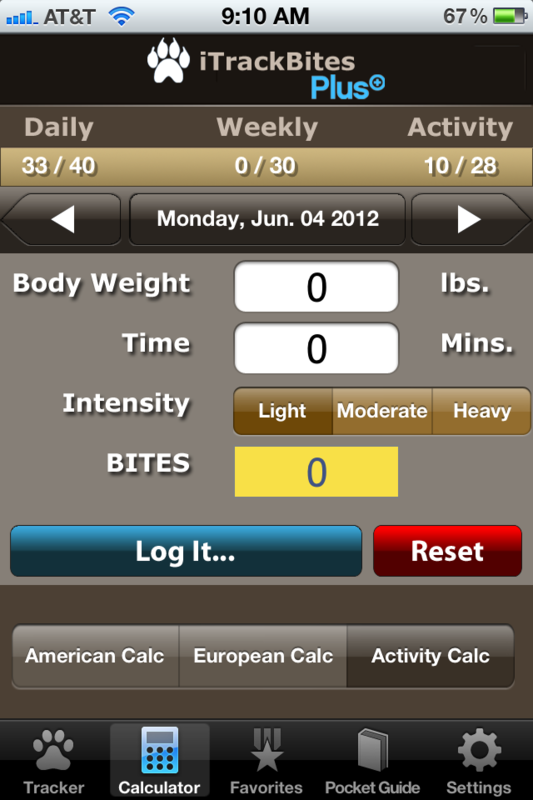 I previously mentioned using apps on your phone to track your food and points for Weight Watchers. I have an iphone and the app I use is “iTrackBites.” I believe it costs $1.99, but there are several available to pick from. There is also a free Android app called “WWDiary.” Whatever app you end up using will look different, but it contains the same basic information. I am going to better explain the app I use so that you can see the same features in other apps and how they can be useful for you. Daily – is the daily points allowance, enter the number that is applicable for you. If you aren’t sure, check out this website and it will provide that number for you. Weekly – is the bonus points. Enter 49 – I know the picture says 30. Long story… just put 49. That’s how many you are allowed. Activity – I default mine at 28. You can change that later as you set new fitness goals. 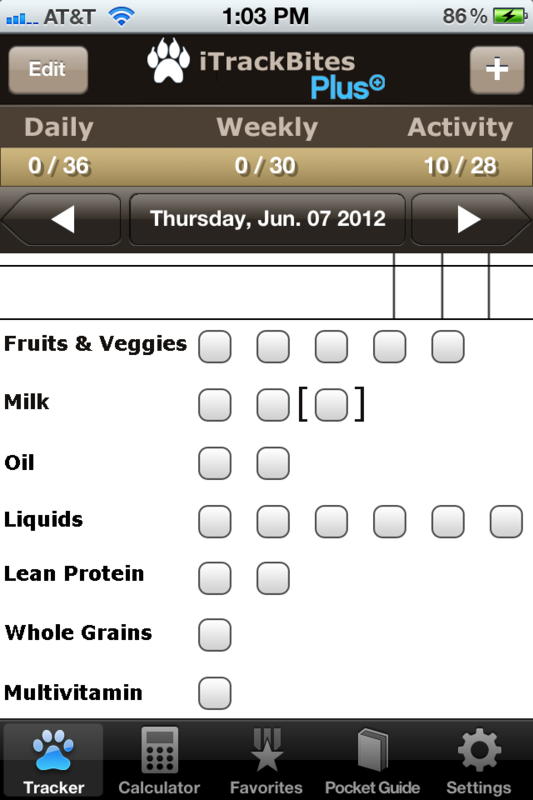 Now look in the bottom left corner where it says “Tracker.” At the top it says “Daily,” which is your daily allowance. In the middle it lists “Weekly,” which is your bonus points, and on the right is “Activity.” For each week as you enter your points used, it will keep track of it for you at the top. 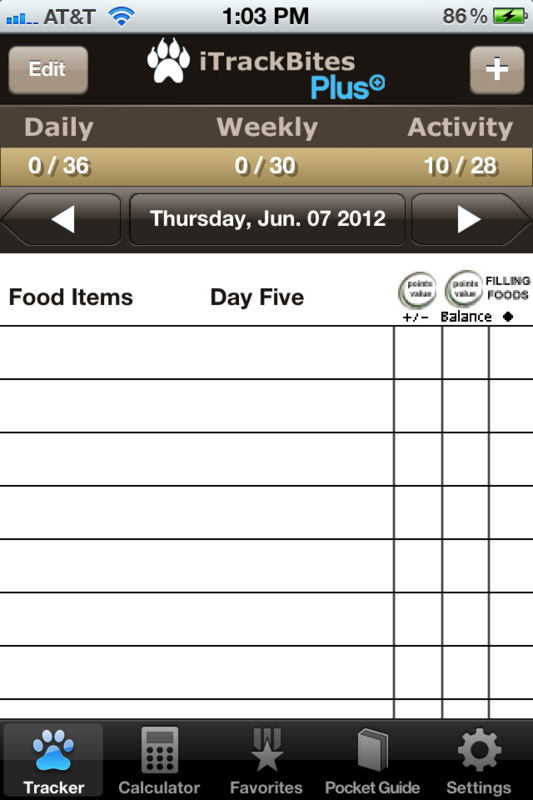 Underneath each day, the food you enter will be listed along with the points per food item. Touch the “+” symbol on the upper right. And from here you have several options. 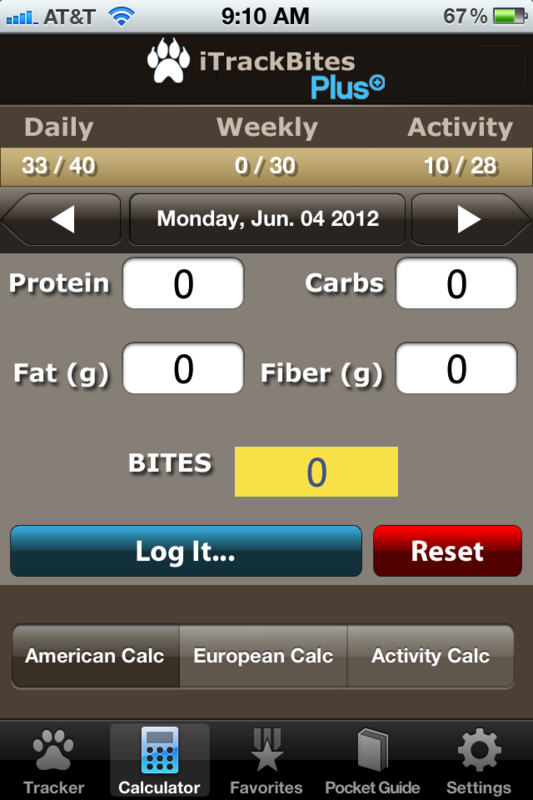 Search Pocket Guide – This pocket guide, which is on the main screen as well (four icons to the right of “Tracker”) provides the points PER SERVING SIZE for every day foods. It is a helpful tool through which information is always readily available to you without having to look the points up. Scroll through this guide and find your favorite foods. One thing to mention here though is that for food like bread and bagels, double check the points with the calculator provided within this app (more information to come about this) because the points will be different for foods that come in different packages. Use this pocket guide instead to find points for foods that will not change despite packaging, like a potatoe, beef, fish, chicken, etc. 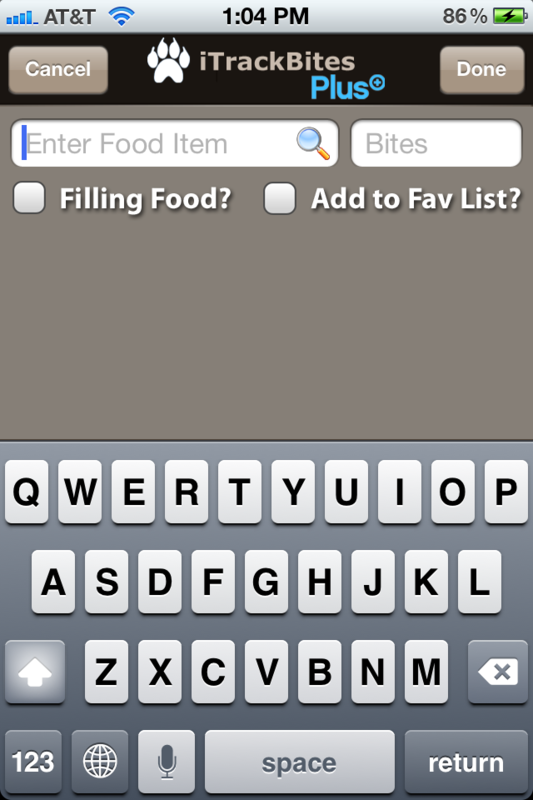 Add to log – here you can enter your food and the points for that food, or as points are called in this app, bites. Pay attention to the option to check the box for “Add to Fav List.” By checking this box, your food will be added to your “Favorites” menu which is located on the main screen to the left of “Pocket Guide.” Similar to the pocket guide, this list will include all of your favorite foods so that once you look up a point per food, you never have to look it up again. One perceived negative that I feel turns people away from Weight Watchers is having to look up points for what you eat. The “Favorites” option eliminates that excuse because once you know the points for a food and enter it as a favorite, you never have to look it up again. As an added note on that, I believe people tend to eat a lot of the same foods. Think about it. How often do you vary your breakfast? Lunch? When you eat out, do you tend to eat a lot of the same places? I do so I didn’t find this to be that hard. Once you learn the points for foods you eat a lot, it’s really not as much work. We covered the Pocket Guide and how to log food. The next option is to “Log Activity.” If you already know the activity and the points for that activity, you can enter that information yourself. If you do not know that information, touch “cancel” and you will be back to the main screen. Look at the bottom, to the right of “Tracker” and to the left of “Favorites” and you will see “Calculator.” You have 2 calculators available to you. One is a FOOD points calculator and the other is an ACTIVITY points calculator. First, let’s check out the food calculator, which you can find by clicking “American Calc” or if you areEuropean use the “European Calc.” It may be defaulted to start on this screen so you may not have to change anything. See below for a picture of the Food Calculator. As long as you know the Protein, Carbs, Fat, And Fiber for any food that has a nutrition label, the app will determine for you the number of Points, or Bites, for that food. 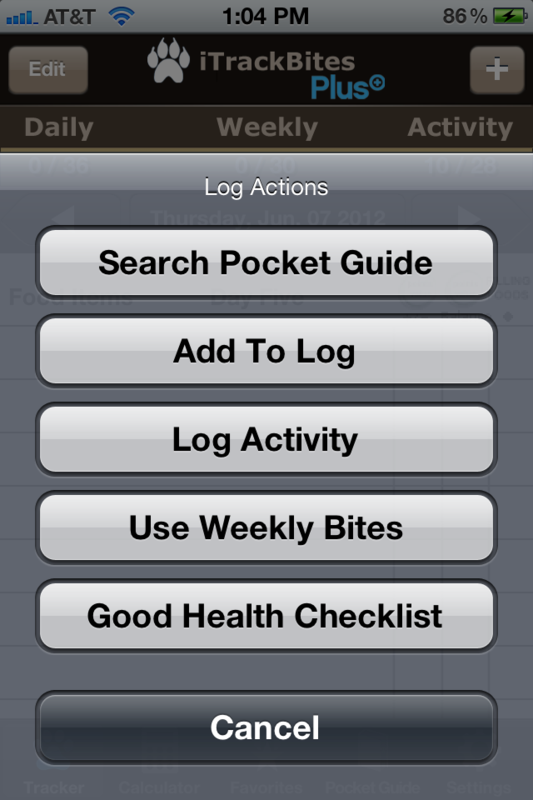 If you end up eating it, touch “Log it” and the points will be provided for you. All you have to do is enter a name for that food and check the box to add it to your “Favorites” if you wish. If you are experimenting, touch “Reset” and the numbers will go back to zero. *** Please note the serving size. If you are eating 2 pieces of toast and after entering the Protein, Carbs, Fat, and Fiber you determine the number of bites to be 2 points. Look at the serving size. If the serving size says 2 slices, and you are eating 2 slices, then entering 2 points is accurate. If the serving size says 1 slice, and you are eating 2 slices, you know now that you are eating double the serving size and must multiple by 2. So for 2 slices, it would be 4 points. Enter the above information and the points for your activity will show. Press “Log it,” enter a name for your activity, and it will appear in your daily list. If you go back to the “+” from the main screen we have 2 options left. One is “Use Weekly Bites,” and it is through this option that you enter your bonus points. No description of the food is necessary. 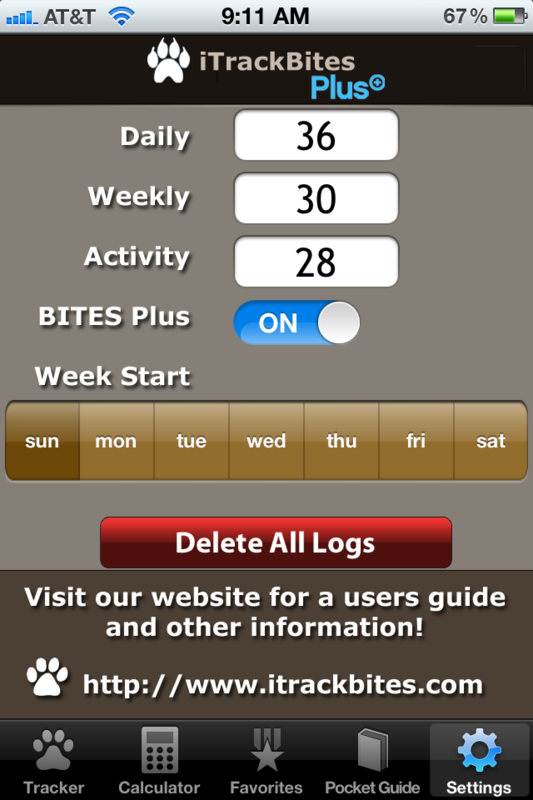 Simply enter a number and it will be calculated within the “Weekly” number at the top of your screen. And last but not least, we have “Good Health Checklist,” which as you can see below is a method to keep track of how many liquids, proteins, etc. you are consuming daily. This would be an easy way to keep track of how much water you are drinking. And that is “iTrackBites!” I consider it one stop for all of the Weight Watchers information you need. If anyone has any questions I’m available through comments on this page to answer them for you. This app is really not as complicated as explaining it may make it appear. As I said above, regardless of whether or not you know the points for food, to start out, this is a great method to keep track of what you are eating daily. However, that said, with this app you have no reason to NOT know the points for food. So start researching! It’s as close as you get to magic! Friday Weigh In & Update! Order your It Works Wraps !